If you have a young adult dog (1-5 years old), try PURINA® BETA® Adult Dry Dog Food with Lamb, the 100% complete and balanced dry food is tailored nutrition for your dog. Your healthy, active adult dog needs nutrients that will help support his continued muscle development and cater for his energy needs. That's why we designed our Adult formula with lamb, it's specialled formulated to help the steady release of energy from fat and protein thanks to the inclusion of B vitamins, while essential minerals and adapted protein levels help continue building strong muscles, teeth and bones, helping your dog to stay at his most adventurous. Added chicory, a natural prebiotic, helps support his digestive health by increasing the good bacteria in the gut, while the crunchy dual size kibble encourages him to chew and maintain good oral health. 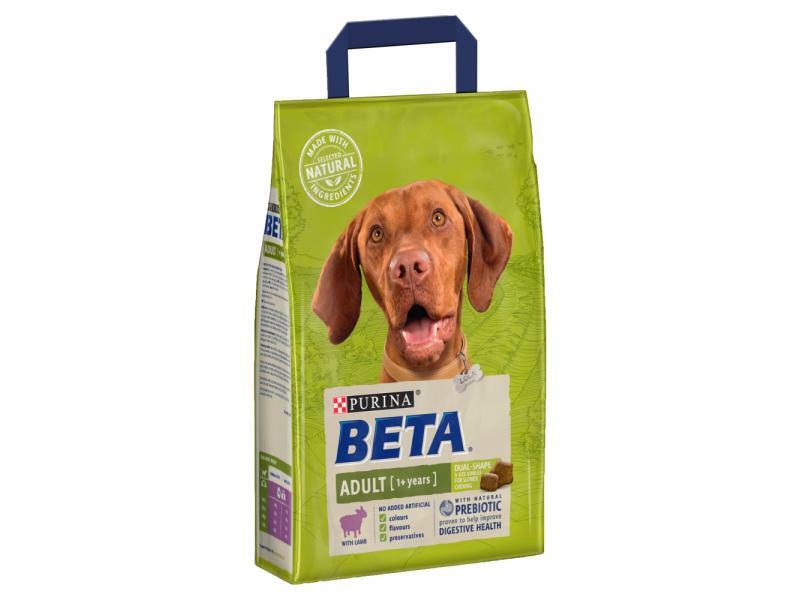 For complete and balanced nutrition specially formulated for young adult dogs, try BETA® Adult today. With all the essential nutrients your adult dog needs. With protein to help support strong musculature. Healthy Skin and Shiny Coat. With vitamin, zinc and omega 3 & 6 fatty acids. With essential minerals and vitamins to help support healthy teeth and bones. Being a Real Dog means running, jumping, chasing, and living a life unleashed. So he needs a food that can properly fuel his natural enthusiasm for life. That is why our PURINA BETA® tailored nutrition for adult dogs includes essential vitamin and minerals to help support healthy bones, and high levels of protein and fat to help support muscle maintenance. It is also specially formulated with selected natural ingredients and a natural prebiotic to help support digestive health, helping to keep your adventurous dog feeling great all day long! And all this without including any added artificial colours, flavours and preservatives. There are currently no questions for PURINA BETA Adult Lamb & Rice Dog Food - be the first to ask one!